Conservation agriculture (CA) can increase resilience to climate change and has the potential to contribute to climate change mitigation. The benefits of CA are highly site- specific. Innovative approaches are needed to overcome barriers for uptake of CA by smallholders. Richards M, Sapkota T, Stirling C, Thierfelder C, Verhulst N, Friedrich T, Kienzle J. 2014. Conservation agriculture: Implementation guidance for policymakers and investors. 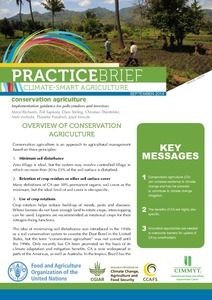 Climate-Smart Agriculture Practice Brief. CGIAR Research Program on Climate Change, Agriculture and Food Security (CCAFS), Copenhagen.